This week's "Fabulous Room" is a striking, glamorous bathroom designed by On Madison in Pasadena, California and photographed by Eric Staudenmaier. The space definitely leans a bit more modern, which I really like. It is a departure on my neo-traditional taste. The crisp, light grey walls are the perfect canvas for the stunning marble floors and modern light fixtures. I like that the designer chose abstract art for the space. The piece behind the tub seems tailor-made for the room. 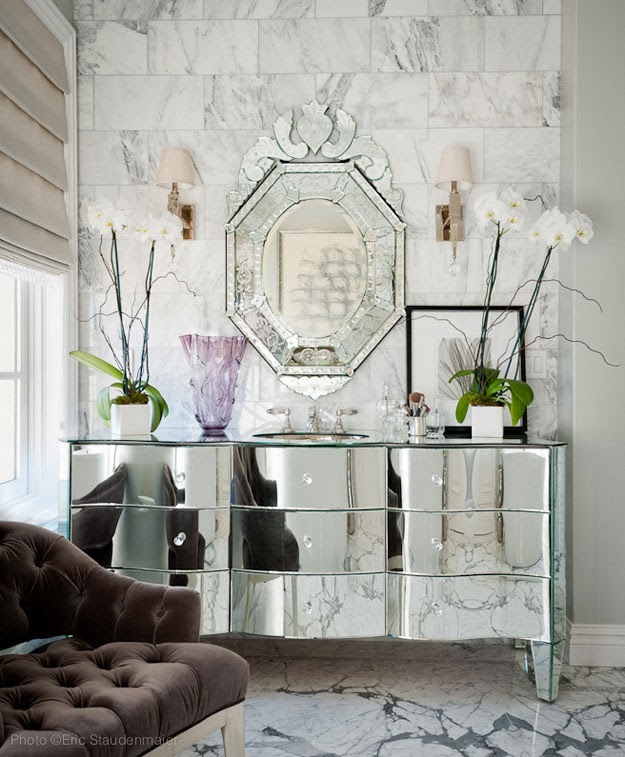 The marble is so beautiful, the mirror is lit well with the two matching sconces, the mirrored sink is amazing and the orchids are a nice touch as well. Wow! That floor and tufted chair are stunning! What a glamorous marble bathroom! I don't think I would ever leave this space. Thanks for sharing! The vanity is amazing. Who made it? @Anonymous Unfortunately, I couldn't find who made it when I was researching this post. I am pretty certain it must be a custom piece. Thanks for reading LDV!